We offer safety support through specialized training in the safe and efficient operation of industry specific tools and equipment. 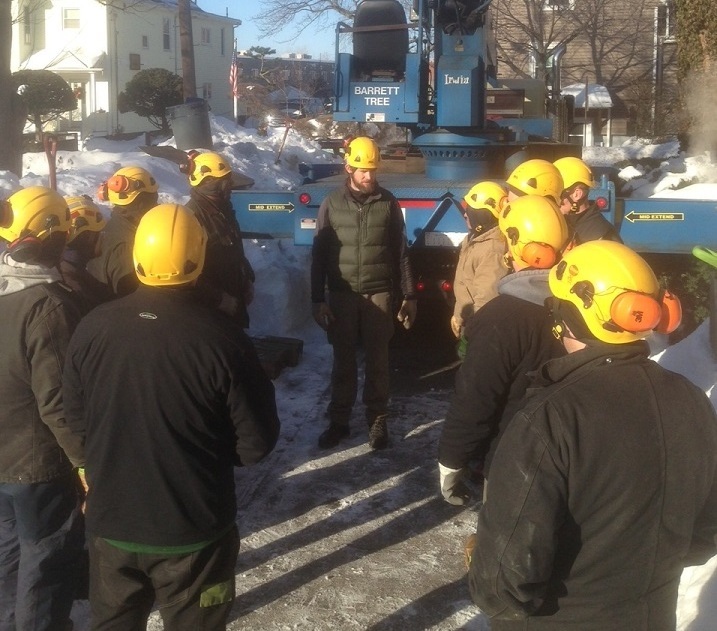 Tree care is one of the most dangerous jobs in the country and Barrett Tree Service East is committed to fostering a culture of safety. A safe environment for employees, clients and the general public is imperative. Through our established training programs, BTSE has developed safe work practices designed to continual educate our staff and prevent accidents. We consider safety an attitude requiring conscious recognition of potential hazards and the knowledge to overcome potentially dangerous situations. One of the ways BTSE reinforces our culture focused on safety is through weekly company wide safety meetings. We strive to remain constantly focused on safety. One of the ways we reinforce this mentality is through weekly company wide safety meetings. Our safety educational programs seek to provide our employees with the tools and information needed to improve safety and professionalism on the jobsite, while complying with national requirements and industry standards. These programs are full of useful practical information specific to arboriculture. We require our employees to participate in a new-hire orientation program, pre-employment drug screening, as well as random drug testing. Training is available to support advancing employees to the highest levels of performance and we provide our employees with the latest in tools and equipment. BTSE’s commitment to ensuring the safety and well-being of all our employees and client’s and has found our safety program helps to reduce work-related injuries while increasing efficiency. Our clients can be assured that working with us ensures a safe, professional jobsite operated by highly skilled, professional arborists.